We started the first session of the second year of the RAW Network by looking at our visions for wellbeing and resilience in our organisations. Now in its second year, the network is in a growth phase, with more organisations joining. We are still working with the emergent and experimenting to find out how to honour resilience and wellbeing together and take our learning back into our organisations. For this year we’ll be using a framework created by our partner Insead: AVIRA – Awareness, Vision, Inspiration, Responsibility and Action. 2017 was all about raising awareness of issues relating to resilience and wellbeing in the workplace, trying things out and sharing ways to thrive, not just survive. For 2018 we’ll be exploring Vision and Inspiration. What’s my vision for RAW? How was it developed? What motivated it? If I don’t have a vision, what might it be? If money was no object and stakeholder support was a given, how would you evolve your vision for RAW? 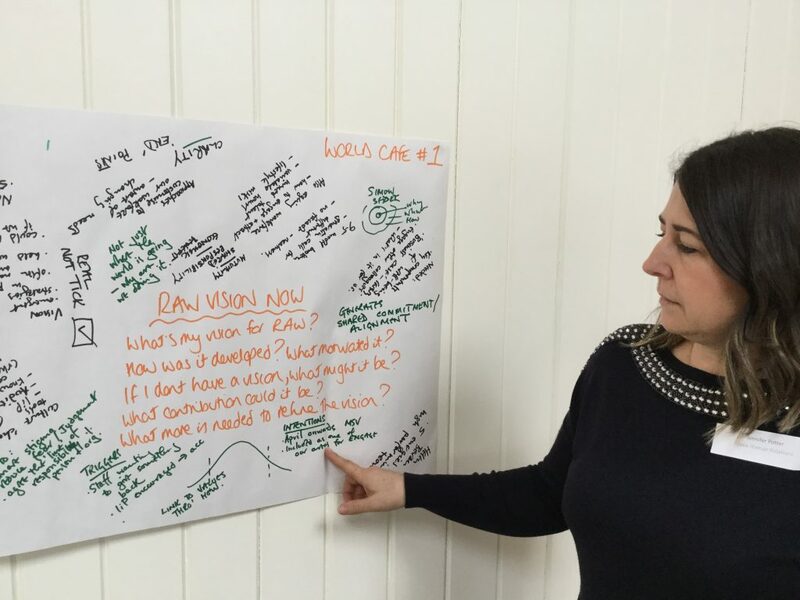 What’s the future vision of RAW likely to be in your organisation? How do you see its role evolving? We also had conversations about how we keep up the momentum and energy between sessions. We’re implementing a buddy system and will be creating an online community so we can share our experiences more easily and keep resilience and wellbeing at the forefront of our minds. Find out more about joining the Resilience and Wellbeing Network by speaking to Lise Ribeiro on 01937 541700 or by email.